I am using emissive maps to create points of coloured light on a mesh. The first time I did it, it worked fine, exactly how I wanted it. Then I tried the exact same thing with a different mesh and it went completely differently. It was as if the black areas of my emissive mask were not fully black and made the entire mesh glow. I checked the colours, the map is completely white and black. I assume this has something to do with the mesh, and if so, what could be different to cause the issue? Are you sure it isn't because the object is selected in the editor? That will make it brighter. No, selection only gives a slight border, it doesn't cause the entire mesh to be emissive. Hmm, odd. Are the UV's and material ID's set up as you would expect? Yes. And I have tried it with the material that works and realised of course, that if the material preview in the blueprint is wrong, it's not a problem with the mesh, my bad. 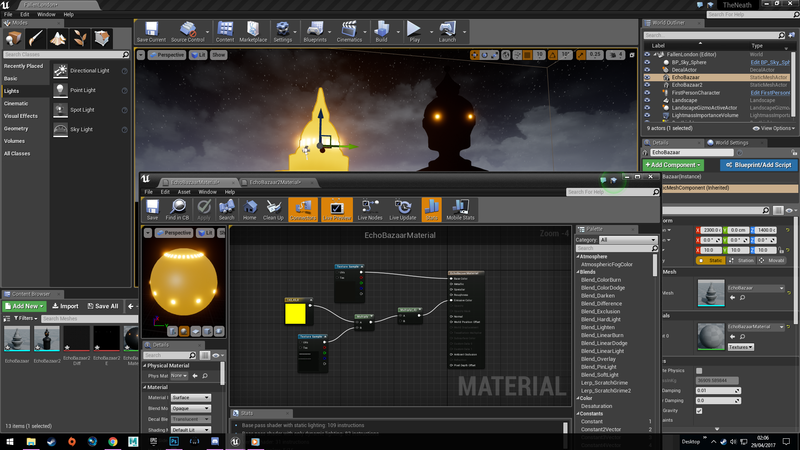 I tried duplicating the material and substituting the textures, and found the issue to be with the emissive mask file. From what I can see, there is no difference between the two maps aside from where the white parts are. in your second material screenshot http://i.imgur.com/b3cZhdK.png the texture sample doesn't look too black in the (supposed to be) black areas. perhaps this comes from the jpg compression of the shot. however please check your texture mask if it has the same compression settings like the first one and also check that it is not changed by any image settings like brightness and stuff like that. Yes, I have checked whether the black is fully black (it is), and I am pretty sure I haven't inadvertently changed any colour settings. Both images were from PSD's in 8-bit RGB. They both have default compression within UE4, and the only difference in the hover-over attributes list is that the working one has 143/260 in the cooking filepath length, whereas the broken one has 142/160 (I don't know what this is so don't know the relevance, if any).